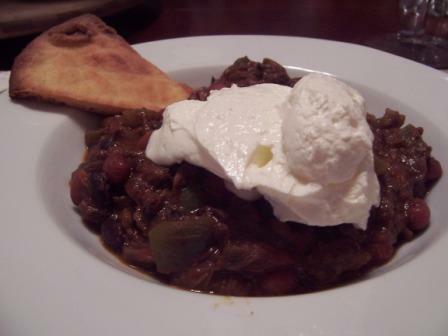 BTW - this picture with that huge dollop of sour cream - that's how my husband served himself! 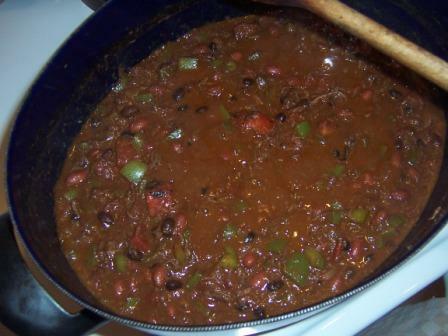 I love chili – but the real deal means to spend a few hours in the kitchen. It’s worth it, but who has the time? Well, I was craving some comfort food last night and remembered that I just bought a package of Pulled beef in Jack Daniel’s Barbecue Sauce in Costco. That could be a great base for chili, I thought. So I added couple of cans of beans and diced tomatoes (I always have stuff like that on hand), combined with some peppers and voila! Delicious chili was on table sooner than 30 minutes! So now you know why shortcut. And why drunken? Well, as the Jack Daniel’s Barbecue Sauce wasn’t enough, I added some red wine to the sauce as well. And, than you need some to drink with the meal …. so enjoy! Heat an oil in the large pan and stir in onion. Cook on medium heat until soft. Add chopped peppers, season with mix and keep cooking for a minute. Add whole can of diced tomatoes with its juice to the pan and let simmer on low heat. Add whole package of Pulled beef in Jack Daniel’s Barbecue sauce incl. the liquid. (I never had it before so I tasted it before I added it to the pan. The sauce was a little sweet which worked great with the heat of jalapeno and the acidity of tomatoes). Break chunks of the meat with wooden spoon so it dissolves in the veggie mix. Keep simmering on low heat. In the meantime drain beans in colander and rinse under running water. If you live in Texas, I guess you skip this step – but I personally love my chili WITH beans. Add beans to the pan, mix together and add about a cup of red wine (any kind is good, I used leftover of my Cotes du Rhone). Let simmer, uncovered, until it thickens. Add more wine if needed and simmer till the flavors combine and peppers are soft. Serve with a dollop of sour cream and tortilla chips. I cut wedges of Indian naan bread, brushed it slightly with olive oil and warmed up in toaster oven for about 10 minutes. We loved it! Well, I usually have my chili with Corona beer and lime. 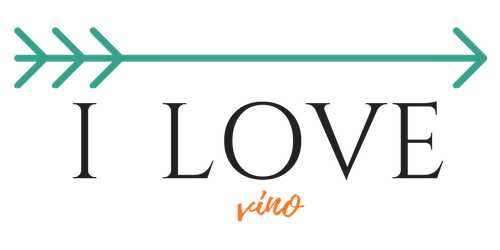 This time I wondered if the big flavors of this chili would stand up to a medium body Spanish red I just discovered recently – I am talking about Las Valles red blend from the region of Cariñena. You know, the common rule says that big bold dish like this should be paired with big bold red. And this red is nothing like that, the wine wasn’t even aged in oak. But I knew it had a spice to it and a lot of fruit, so it should pair great. My expectation was proven right! Try it, you will be truly surprised! Next postHow do I pick wines for my reviews?